I am much more pleased with how this turned out than I thought I'd be. Yellow is the hardest color to use monochromatically, in my opinion. 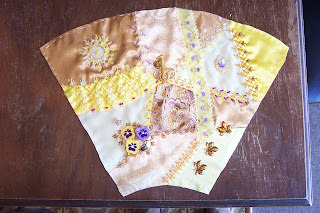 My fabric goes from palest yellow silk to deep gold satin, and the center patch of yellow, gold, and brown brocade. My threads are similarly limited, so I used ecru too, and metallic gold. Same for buttons; an ecru one for the center of the "sun" and metallic gold for the balancing buttons under the giraffe and the heart with the pansies (I do love pansies). Just a funny remembrance: Once when Michaela was in 1st grade she was asked by her teacher what her favorite flower was and she said, "The scary ones." That confused the teacher, but I knew exactly what she meant. When she was about two, she was scared silly of pansies. Show her one in a pot and she'd run. Their little "faces" looked menacing to her, I guess. She wasn't articulate enough at 2 to explain her fear, and by first grade she'd made friends with them, so we'll never know for sure. I am really liking this projects. You are so creative! Oh Janet! I think this wedge came out great too! I love the use of purple on the yellow block~ I can't wait to see til your color wheel is done! So Artistic! Loving watching you make this project! thank you so much for sharing your ideas, talent and creativity!! I think this is the best yet!!!! where do you find those pansy buttons? I would like to know how you intend to complete this project or has that yet to be decided? Oh, Janet! I love yellow but don't do much with it as sometimes it is hard to work with ... for me that is .... but this is absolutely stunning!!! Makes me want to do something with tone on tone but yet not a wheel like you're doing. You are so inspirational!!!! I had been contemplating a color wheel too! Just was gonna use my squares and make it like a 9 patch but that didnt satisfy me at all. SOOOO...I just drafted up my "wheel" of muslin today and marked it , I am doing mine a tad bit different so Im not a copy cat! I will put strata of colors on each wedge darkest to lightest. I LOVE your stitches! Gosh Im jealous!